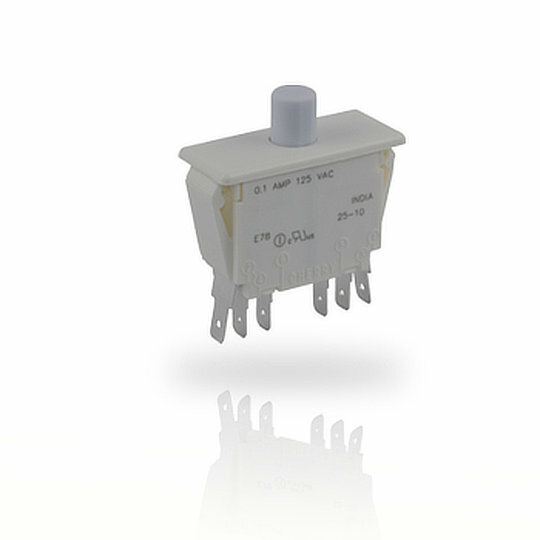 The E/F7 series of panel mount pushbuttons from ZF are double pole switches with double throw operation and momentary or push – pull action. The E/F7 has a choice of 6 actuator functions, is electrically rated to 16A at 250VAC and has a mechanical life of 50,000 cycles. The E/F7 series of panel mount pushbuttons from ZF are double pole switches with double throw operation and momentary or push – pull action. The E/F7 has a choice of 6 actuator functions, is electrically rated to 16A at 250VAC and has a mechanical life of 50,000 cycles. The E/F7 series comes with quick connect terminals and snap-in panel mounting for quick and easy installation into panel cut outs of 28.32mm by 13.97mm and has housing dimensions of 25.65mm by 12.95mm and a depth of 24.64mm. The E/F7 series is perfect for applications such as Vending Machines, Control Panels, Industrial Control Systems, Robotic Controls and Parking Machines.